Chilly winds blow into the High Desert and many of us wonder how severe of a winter is about to arrive. Will it be another snowpocalypse? Will Mt. Bachelor diehards be praying for snow? Because of heating bills to come, many of us are looking at our own homes and wondering what we can do to be more energy efficient. At the High Desert Museum, improving the energy efficiency of a building with sections that are almost 40 years old has long been a priority. In 2017, the Museum signed on to the Energy Trust of Oregon Strategic Energy Management Program. After a year of efforts big and small to improve energy usage around the property, the Museum saved 101,488 kWh. That translates into $10,149 in savings on electricity bills, well above our initial goal. •	New LED lights replaced older, inefficient T12 and T8 fluorescent lights. •	The Birds of Prey washer and dryer were replaced with more efficient units. •	Two refrigeration units and the ice maker were upgraded with Energy Star units. •	Motion light switches were added to mechanical, office and meeting areas. •	HVAC systems have been optimized. In addition, in the first nine months of 2018, the Museum has saved 201,128 kWh. That’s over $20,000 in savings! We’re planning for more work ahead. 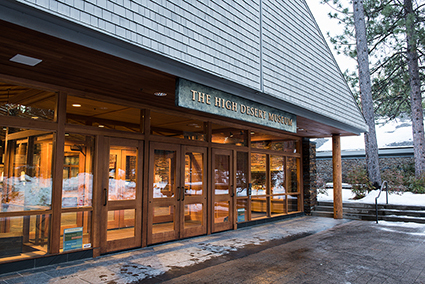 The High Desert Museum was the first commercial building in Oregon to install solar power, back in December 1994. It was done as a research opportunity through Mobil Solar Energy Corp and the University of Oregon. Today, the panels are 23 years old. Therefore, University of Oregon staff will be returning in the coming months to hook the panels up to the internet in order to track production, among other things. We will all be able to see how our solar panels are functioning. If need be, necessary improvements will be made. The High Desert Museum strives to be wise, responsible stewards of the generous resources given to us. We’ve made huge strides in our energy efficiency, but we will never consider this critical project complete. Most importantly, we remain committed to the Strategic Energy Management Program through 2018 and into the future.